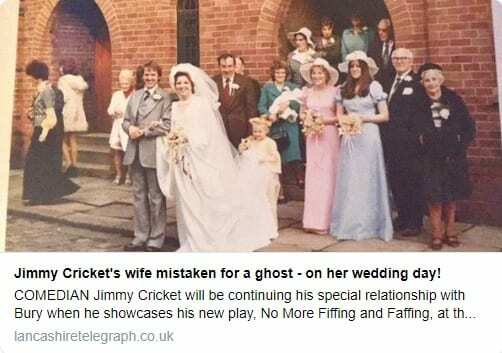 Jimmy Cricket’s appearance in Lancashire at the weekend has been previewed by a regional newspaper. The famous entertainer appears at Oswaldtwistle Civic Arts Centre on Saturday 27 January. An article in the Lancashire Telegraph, which the comedian shared on social media channel Twitter, begins: “Complacency is a word which you suspect doesn’t figure in Jimmy Cricket’s vocabulary. “The veteran comedian could be forgiven for taking things easy after a lifetime making people laugh. “But at 72, his diary is as busy as ever and, as he prepares to come to Oswaldtwistle Civic Arts Centre on Saturday. the genial Irishman revealed it’s the gift of laughter which keeps him going. “Jimmy will be bringing his Great Value for a Tenner show back to Oswaldtwistle which, as the name implies, has a fixed ticket price.